The Collingsworth Family’s third mainline release with Stowtown Records, That Day Is Coming, continues to build on the catalog of musical excellence that has brought them to the top of the gospel music genre. Indeed, the first word that comes to mind when I think of Collingsworth music is that word: excellence. They are perhaps the greatest ensemble of pure talent in gospel music, but real excellence doesn’t come from just talent. A series of videos the family put out ahead of this release covering the recording process is a testament to their dedication to their craft and attention to detail. With Wayne Haun once again in the producer’s chair, That Day Is Coming is, as usual, one of the best gospel music recordings of the year. With the Collingsworths’ ability to create an awe-inspiring wall of sound, their big, sweeping arrangements are a hallmark of their recordings. The one getting early buzz is the inspirational ballad, “You’re About to Climb,” featuring the eldest sibling, Brooklyn. Though she is most often the one carrying the melody, she has not gotten as many opportunities as one might think to be spotlighted in a big song. This one changes that, and as such, stands to become a potential signature song for the young soprano. The recording’s other power ballad, “When He Carries Me Away,” is absolutely one of my personal favorites on the album. Featuring the rich alto tones of mama Kim, it starts softly before “carrying away” the listener to heaven with a mighty orchestrated arrangement. The family’s previous mainline recording, The Lord Is Good, contained what I thought to be their best collection of uptempo songs to that point. That Day Is Coming has very good ones, too, but once again, I find myself wishing there were one or two more on a recording that leans on the slower tempo side. The title song has a catchy energy befitting its Second Coming theme and will surely be a crowd-pleaser. “There’s Still Power in the Blood” is an outstanding Talleys cover featuring papa Phil, and the turnaround of the hymn “There’s Power in the Blood” is most welcome. The supremely talented Phillip Jr. doesn’t get nearly as many features on this recording as on The Lord Is Good and Hymns from Home in 2013, but he makes his opportunity count with another personal favorite, the fun and rollicking “What the Bible Says”. Middle daughter Courtney is perhaps underrated because she is so strong at anchoring the middle of the stack of harmony, but the family has consistently picked great songs to feature her, like “I Can Trust Jesus” and “I Found It All”. They picked another very good one here with “Gotta Get to Jesus,” with a stirring message launched from the story of the woman who touched Jesus’ garment. The youngest sibling, Olivia, has been gradually worked into the family’s presentation as her voice has matured, and it’s clear she has now solidified a keystone role. Her features on the recording, the easy-going “I Love Living in Love With Jesus” and the Martins cover “Wherever You Are,” are her best vocal showing yet. For the first time, the Collingsworths get an in-law involved in their recording. Phillip’s wife Sharlenae shows she has plenty of vocal chops as well on the beautiful “Redeemer of the Rain,” most of which is a husband/wife duet. All of the songs mentioned in this paragraph fall in a more slow tempo, contemplative category, of which That Day Is Coming contains plenty of examples. Among them, my favorite is probably “Saints Love to Sing About Heaven”. Brooklyn has the feature, but the highlight is the ensemble singing in the chorus, which one has to think bears a resemblance to the singing that will be heard in that heavenly home. One more name needs to mentioned as a star of this album in addition to the seven vocalists. Is it possible that Rachel McCutcheon has become to the Collingsworth Family what Dianne Wilkinson is to the Kingdom Heirs? McCutcheon has eight, count ’em, eight cuts on That Day Is Coming, and there is not a dud among them. Plucked from seemingly out of nowhere by Wayne Haun just a couple of years ago, McCutcheon’s songs and Collingsworth voices are a match made in heaven. The Collingsworth Familty has been blessed with an abundance of talent, and with seven different voices featured, they are capable of a variety of different sounds, all of which are executed to near perfection. The slight dearth of fast songs is only a mild criticism; it’s really just the group going with what has brought the most success. And it’s hard to argue with the kind of success this family has enjoyed in recent years. If That Day Is Coming is any indicator, that is not going to end any time soon. 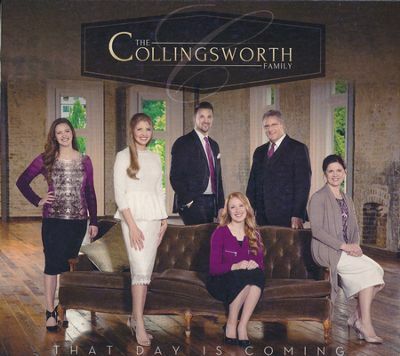 This new Collingsworth Family album, That Day is Coming, is their absolute best thus far. The richness of their family vocals is second to none in Gospel music today. These are powerful songs that each stand alone as deeply spiritual songs. Thanks for your critique. I totally agree with your assessments.